— Because of a sudden burst of social media a music video goes viral. But that doesn’t mean it will make a dent…or a buck. — Because of an unprecedented continuous blitzkrieg of media coverage, a politician’s numbers rise. But that doesn’t mean he will win the election. — Just because many people applaud your work and acknowledge your talent, doesn’t mean they’ll fork over the greenbacks to buy your merch. — Just because you get a thousand “likes” doesn’t mean you’re almost famous. 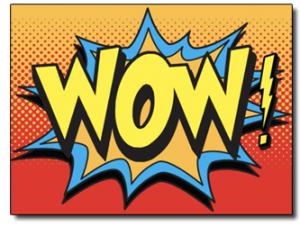 Important because the “wow factor” is just the first step in the ongoing process of attracting a loyal, devoted tribe of fans, clients and customers. What truly matters are the actions we take in the wake of that splash that will determine whether or not our music, art, product or service generates a profit, gains momentum, moves the dial, or propels us to the next level.